Hmmm OK I see what your saying but I just don't like the idea of a map for each cylinder, from a tuning point of view your effectively tuning four single cylinder engines which is obviously a pain. What about one proper full fuel map, then a modifier map for each cylinder which would just be +-1% or whatever in a 3d table? That way you still have a central table where 99% of your tuning is going to take place for ease of use. OK yeah thats reasonable. Just wondering if the same thing could be achieved with a percentage modifier? For instance at X degrees C add 10% extra fuel. That way it's not a fixed amount like "add 1ml extra" it will scale up with load and RPM. Generally it will just be a percentage indeed. A MAF needs an air temp sensor, your thinking of a MAP sensor. I don't predict needing a map to time the fuel to valve opening, I plan to modify my engine with a unique intake system that will basically negate sequential injections benefits(and make a MAP sensor useless), regardless it's no trouble to program a basic version in. I Plan on making a few different versions just for the hell of it. Directly after valve closure, maximum time for evaporation, perhaps enable this on start and warmup. Directly before valve opening, injector would just finish as the valve was just opening. On valve opening. And some others, maybe switch between different modes for different conditions. Of course these would be offset-able, probably setup a scaling offset with RPM. All this assuming the injector pulse is short enough in the first place. I would like to know why you think a MAF sensor requires an AIT sensor. To be able to tell the ecu like I want to injector on the valve for better MPG or while the valve is open and not use a MAP of injection timing would make me think. Once I've calculated the A/F ratio and injected the fuel I then need to time the ignition. To do this I will lookup the degrees BTDC in a A/F vs RPM map, calculate the time in milliseconds or clock cycles after the relevant cam position sensor using the RPM and set an interrupt. That way I could see working maybe as an additive map but not as a main ign table map. You don't take into consideration load like that. Lookup MAF's, they need an IAT sensor, otherwise they would only give you an accurate air mass reading at one specific air temperature. Sometimes the MAF and IAT are an all-in-one unit so maybe you've seen that and not realized there is an IAT built in? Unless you've got some sort of VVT then your valve is always going to open at the same time with regard to the camshaft angle. 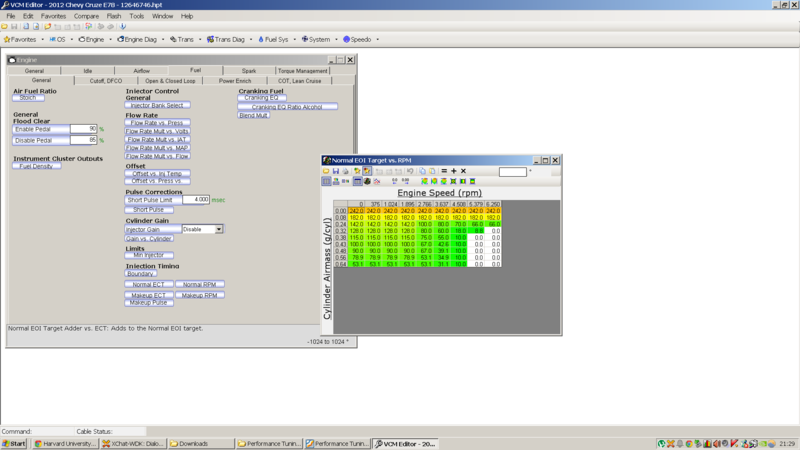 The Load is built in to the A/F ratio calculation already done in the fuel map. I've seen several maf's most that IAT's generally have them going to the ECU but not for the maf, but using for spark correction. I'm going with the standard hot wire \ hot film, both these wouldn't require an IAT sensor to give an accurate air mass reading imo. push a bunch of air over thats heated up and its not gonna cool the wire as much, put a bunch of air over thats cool and it w ill cool the wire more. Seen\have several maf's I've dealt with them a good bit. So you are stuck with a system that is like a carb and a dizzy. What happens when you want to accelerate without increase fueling? go to 50-60% throttle and stay at stoichmetric. I can only think that you mean "what happens if you want to accelerate very slowly"? Which would mean that the difference in throttle position and RPM where minimal. In that case the A/F calculated from the map would be very close to stoichiometric assuming you had the map cell for that RPM stoichiometric. In the map you could always make the next cell along from no load/acceleration be stoichiometric or close to it. Would also be simple enough to add a rule where you would have to go above say 10% of the distance to the next cell before factoring it into the A/F calculation. Boost would be basically directly related to RPM would it not? So you would tune your engine around the RPM where boost would come on differently than at idle or at high RPM. In any case if you have forced induction it would make sense to have a pressure sensor. Maybe I wasn't clear about my goals here. I'm planning to make a one off custom ECU for a specific vehicle, which is a naturally aspirated 4cylinder 600cc motorbike. I will tell you that yes the IAT is used for figuring out density, but thats used in a Speed Density application, not for a MAF applification that directly can read the mass of air. Now a AFM that uses a flapper door or plunger will require an IAT sensor because its reading volume of air and needs a density correction. yes and no, depends on what you are using, turbo\super and the setup. We can see the temp sensor required for the maf itself is intergrated into it and has nothing to do with the ecu. I have had these thoughts for years. When you look at a ECU fuel map in 3D or any other graphical way it definitely is a mathematical thing that could be defined with an algorithm. I've looked at some code for things that work, like the old Chrysler SMEC code and FreeEms which use a self adjusting map. It's honestly so simple it's nauseating. FreeEms works just like the old SMEC code (Only it's faster and has non-volatile memory). A series of For loops with 3 If statements <>=. Then it's offset by TPS, ACT. If I'm correct, the advance is pretty much dictated by the MAP sensor. Sure you could make a self learning Algorithmic system that only held a few variables to manipulate the curve. But- would it work All the Time?